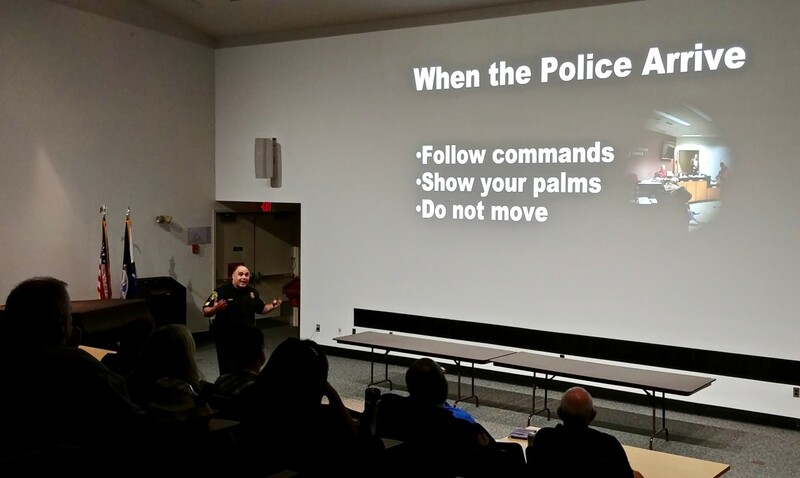 Civilian Response to Active Shooter Events presentation offered tips on surviving a mass shooting. In 2018, there have been nearly 300 mass murder attempts in the United States. These include mass shootings in which four or more people were shot at the same general time and location. That averages to at least four Americans whose lives have been changed irrevocably for every day of the year due to an attempted mass murderer. In the Oct. 24 lunchtime seminar, “Civilian Response to Active Shooter Events,” Sergeant Randy Cupp of the Newport News Police Department offered a brief history of mass shooting events, a look at the psychology of shooters and survivors, and a proven plan for your best chance of survival in these situations. Each of these events started with a wannabe murderer. Mass shooters tend to share a variety of key risk factors, including a history of violence, exposure to violence, substance abuse, mental illness, a history of harassing or threatening behavior, negative family dynamics, and isolation or instability. “Active shooters don’t have a profile. They have all different ideologies. But as for race, how much education they have, it’s all over the map. Typically, they have an avenger mindset. And typically, they do broadcast, whether it’s on Facebook or somewhere else,” Cupp said. And they tend to act alone. Most mass shootings are the work of a single shooter. In the case of 200 mass murders reviewed from 2000 to 2015, 98 percent were carried out by one person. That one person is not only fascinated by violence, but also avoids close contact with and forming relationships with other people. “It’s not so easy to kill somebody when you’re looking at them as a mother or a brother, or when you’re considering the needs of other people” Cupp explained. So how can you get the upper hand in an active shooter or other emergency situation? By being aware of your surroundings at all times, by being prepared to react quickly and decisively, and by choosing the best strategy and carrying it out. Collectively, these can be thought of as Avoid, Deny, Defend. Cupp said that in an emergency situation, people typically go through the three stages of disaster response: denial, deliberation, and the decisive moment. The faster that you process through these three stages, the more likely you will survive an active shooter event. In the first stage, denial, you may not understand what is happening. For instance, you may attribute gun shots to a prankster’s fire crackers or an explosion to an accident. You may not react right away, because you don’t recognize the significance of the situation. You may even look to others who may have the same slowed realization to help determine if you really are in danger or not. Once you realize that a situation is dangerous, you may then have a stress response, with rapid heartbeat and rising blood pressure making it difficult to calmly consider the options and best course of action. And once an action is decided upon, you may proceed slowly or with great care, still not fully recognizing the need for decisive action. In light of these typical reactions, Cupp recommended a clear strategy for responding to a dangerous situation in a crisis: Avoid, Deny, Defend. First, always be aware of your surroundings, especially in public or crowded places, the most likely scenes of attempted mass murders. Consider your best response should you become involved in an incident: how would you get out (avoid), where would you barricade yourself away from the shooter (deny), how would you fight back (defend)? “As soon as you enter an establishment, check out the area. In a crisis, you need to get out. Have your plan ahead of time. That may give you a chance of survival,” Cupp said. If you are caught in an active shooter or other emergency situation, resolve to move past denial quickly but calmly and on to considering your best actions. As you accept that you’re in a dangerous situation, realize that you can become paralyzed by your own stress response. But you can take control and use that response to help you act. “Breathe in through your nose to prevent hyperventilation. Take that fear and turn it into anger,” said Cupp. Then use that anger to help you decide your best course of action. “Once you’re past denial, and you know what your plan is, it’s time to move, time to act,” Cupp said. What you do will depend on your situation. However, resolve to do something. “Playing dead is not really an option. Research shows that an active shooter will go along and shoot people on the ground,” Cupp said. Avoid the situation, putting as much distance and barriers between yourself and the attacker as possible as you leave the area. Deny the attacker an easy target when you can’t leave the area, by barricading yourself away from him/her, turning out the lights, locking doors, and/or hiding behind objects. Defend yourself decisively and aggressively when it is your best option. “You are completely justified in any realm to defend yourself and those around you. What you do matters,” Cupp said. Finally, once police arrive on the scene, typically in about three minutes from the first report, be prepared to follow instructions. Leave behind any packages, bags or other items. Always show your empty hands and keep them away from your body. If you’d like more information on your options in an active shooter or other emergency situation, see the Avoid, Deny, Defend website.